If you like using heat to relieve pain, get this now! Get it in every color! It heats up nicely, stays warm for about half an hour, and it is easily reset by boiling it. I think everyone should have one of these in their first aid kit for sore muscles and other aches and pains. It's cheap, it works, and you can use it over and over again. No downsides! The Heart Warmer is a reusable chemical warming pack, meant to ease body aches and pains, warm cold hands or feet, to aid a massage, or can even be used to warm up your bed before you get in. 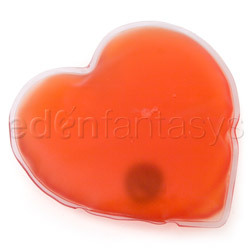 It is a pretty simple little device made with a red super-cooled sodium acetate solution and a metal disk, sealed up in a little PVC heart. You snap the disk and crystals begin to form in the liquid as it heats up. It heats to around 130F and it stays pretty warm, for around 30 minutes to an hour. It will stay warm longer if it is wrapped up in a towel, to keep it insulated. Use it however you want, and when it has cooled down it will be completely solid and ready to recharge. Massage the pack a little to break up the crystals enough for the pack to feel soft to keep it a little warmer as well. Disturbing the crystals means it will take longer to freeze, keeping it warmer longer. Yes, I said this magical hot pack is freezing. I'll go into that later. To return it to its original state, you boil it for about 10 minutes or until all of the crystals have dissolved again. Just fold a towel and place it in the bottom of a saucepan, put the heart on the towel, cover it with water and put it on the stove to boil. Let it cool off, and it is ready to go again. It can pretty much be reused indefinitely. Here is the point in this review where I'm going to get into the science of how these neat little things work. Feel free to skip over this part if you don't want the chemistry lesson, but I will say it is pretty interesting. It works by a chemical reaction started by snapping the little metal disc that floats in the liquid. Sodium acetate freezes (becomes solid) at 130F. The solution is super cooled in a way to keep it liquid well under the temperature where it would normally freeze, which is possible because the liquid form of sodium acetate is very stable. The disc, when clicked, agitates the solution enough to start the freezing process with a few crystals, which spread across the solution until it all freezes. "But wait," you may say, "doesn't freezing mean something gets colder?" Not necessarily! Because the freezing point is so high, the super cooled solution warms up, giving off energy as it forms crystals. Freezing always takes place at the exact freezing temperature of a solution, so until all of it is frozen, the crystals will all be at 130F. Only once the whole thing is solid will it cool off. Boiling melts the crystals down and returns the liquid to its super cooled state. It seems like magic, but it's just chemistry. Same thing, right? Okay, now that the science lesson is over, on to the fun part -- what to use it for! I love using this thing for easing aches and pains. I have a lot of back and neck problems, so pain is pretty much a daily thing for me. Heat is one of the best things I've found to help relieve some of this pain aside from heavy duty meds. So I love warming pads. I don't like electric heating pads so much because I don't like being stuck sitting somewhere just to be close enough to an outlet to use it. I've used lots of the little disposable air activated stick on ones, but those things cost an arm and a leg and they only work once. So I was very happy to find a reusable heat pack. All I have to do is activate it, stick it in the back of my shirt, and lean back and enjoy the heat. I've found that it is good for knee pain as well. The heart shape makes it fit underneath my knee perfectly. So that's how I use it. It would also be good for nursing mothers to use to ease sore breasts with some heat. It would be great for warming your (or a partner's) muscles up before a massage. You could activate it and slip it between you sheets an hour or so before bed to make your bed nice and toasty. You could bring it with you on a cold day to keep in a pocket to keep your hands nice and cozy. It would be nice for warming up a sleeping bag on a camping trip. It is also great for bringing with you to sporting events or on trips for easing any injuries that may occur. As I've said, this thing is great. However, like with all warming devices it comes with some warnings and limitations on use. It doesn't heat up enough to cause burns in most cases, but care should always be taken with using heating pads or packs on the very young, the elderly, people with diabetes who have any circulation issues or numbness in their extremities. Essentially if someone isn't old enough or well enough to tell you it's too hot or to move it on their own, you shouldn't use it on them. 130F isn't hot enough to burn in most cases, and it can't get any hotter than that, but it is still very warm and could damage someone with thin skin or poor circulation. And we don't want that to happen! Also, do not microwave the Heart Warmer to get it hot. It has a stainless steel disk in it. Metal and microwaves do not mix! At best, the heart would probably explode covering your microwave with its insides and making a giant mess, and at worst you could be injured and possibly need a new microwave. I've seen a microwave go haywire and break from a metal disk about the same size as the one in the Heart Warmer. It wasn't pretty. Also, do not freeze the Heart Warmer. It will not freeze in the freezer. Now you know what it is, how it works, what you should use it for, and what you shouldn't do with it, go buy one already! It's a nice inexpensive product that is great for quick first aid or just relaxing a sore muscle. And who here has never pulled a muscle, woke up with a stiff neck, or done something in bed that resulted in being sore for a couple days? And it can be used over and over again! I've had mine for about a month, I've used it daily, and so far it's working the same as it did the day I got it. I don't see it degrading any time soon, but I do plan on picking up a few more just to have spares and to be able to heat more than one body part at a time. I still really love this thing. It's been nearly a year since I bought it, and it still works well, although I don't think it is staying warm quite as long as it did at first. That might just be time playing tricks on my memory, though. It's simple and effective for aches and pains. I still plan on buying one or two more just so I can cover a larger area with heat or so I don't have to wait until it has melted down in the hot water and cooled off before I can use it again. I have lots of back pain, so having something as easy to use as this is just wonderful. It is great on cold nights for just keeping you a little bit warmer, too! Just snap the little disc and slip it between your sheets before bed for a nice warm spot to sleep in! Thanks for sharing. I am wondering whether I should get one of these for each of my kids for when we go to winter events.I am afraid the plastic outside might not be strong enough. I have two of these and LOVE them!!! I wish they would stay warm longer too but they have lasted for years!! thanks for sharing!! Funluvinmama - the plastic is very strong. I don't see it breaking unless you poked a hole in it or took scissors to it, but even that would take a bit of effort. Even when hot, it feels like it could take a good bit of wear and tear. There's not much stretch to it, and it feels at least a millimeter thick. Even if it does break or leak, the solution inside is nontoxic. Is this easy to boil? Which is better Heartwarmer or Hot Love? Thank you for viewing Heart warmer – massager review page!